Why Art? 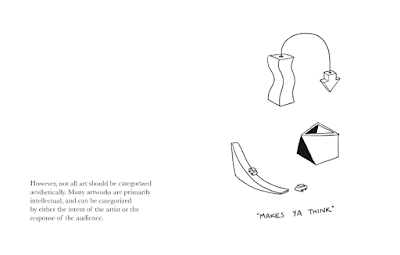 The titular question posed by Eleanor Davis in her new graphic manifesto seems to supersede an implicit, thornier one that’s been asked of creators and consumers since Lascaux: What is Art? What constitutes it, and for both creators and consumers, what purpose does it serve? Why Art? 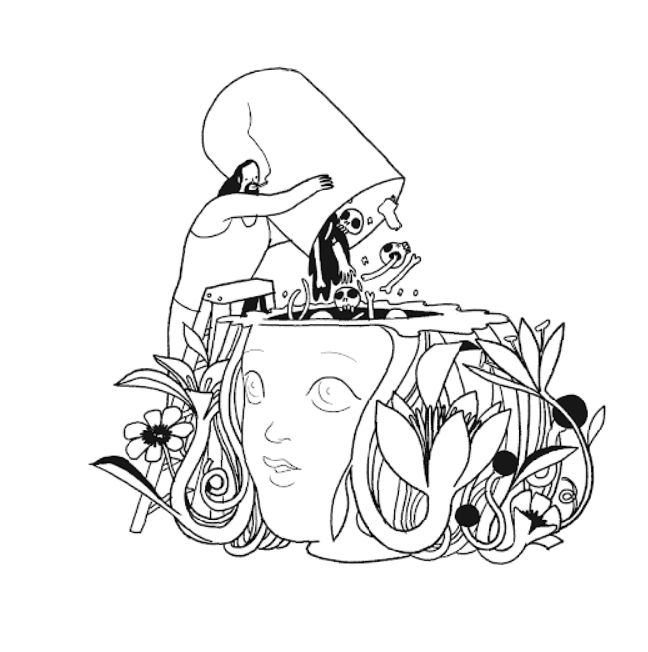 proposes some ideas, if not answers, in response to these and other numinous uncertainties about the societal, political, and personal purpose of creative endeavor. 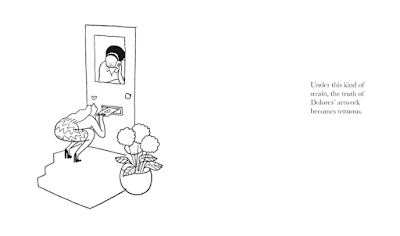 Before we open to page one of the book, we see a minute illustration of an infant and a crow intertwined, and we read a title page that lists this new book as a fourth edition. Even here, Davis confronts us with contradictory and contrasting juxtapositions: old and new, life and death, the nature of iteration in a creative context. 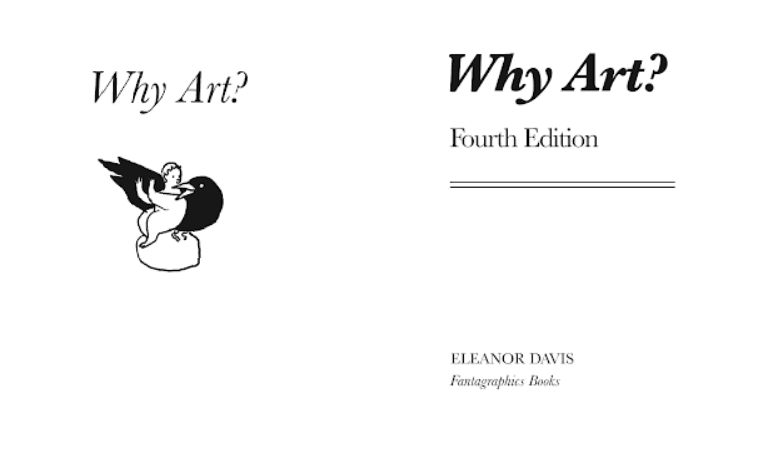 Both pages introduce a concept which Why Art? bears out in its pages, that art is inherently collaborative. As an audience, we’ve brought our own expectations, our own iconographic associations, and our own biases into our reading of Davis’ book. We can’t help but start out judging books by their covers. Davis begins by inviting us to look at examples of different sorts of artwork. 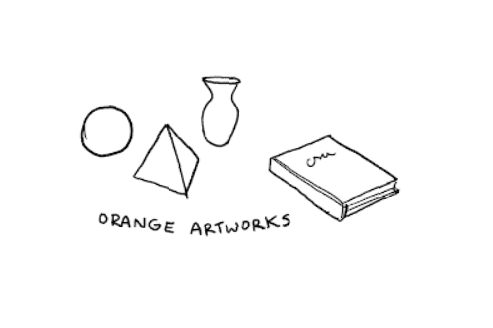 The first box into which she organizes art objects is “color”, and in a book which incorporates color later on, curiously we see these initial drawings of objects in black and white, their hues described by the labels beneath (“orange artworks”, “blue ones”). 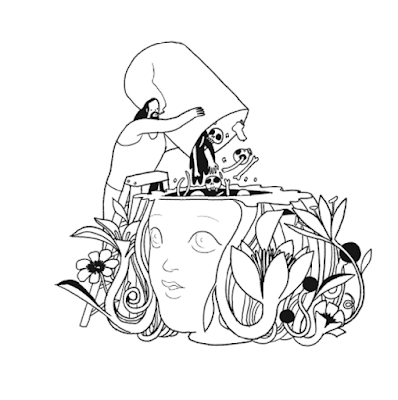 Already, Davis is taking full advantage of graphic narrative as a form. We experience here the slippage between our sensory, aesthetic experience of an image, and what we’re told about it. Davis may here be invoking Magritte’s The Treachery of Images, making her audience aware of the objects on the page as drawings, and forcing them to become complicit in the creation of the “complete” intended image experience: objects with color that can be categorized as such. But where “This is not a pipe” encourages objective distance from the illusory power of trompe l'oeil, Davis’ color labels instead draw us in deeper, ask us to imagine the defining color that she tells us is there. 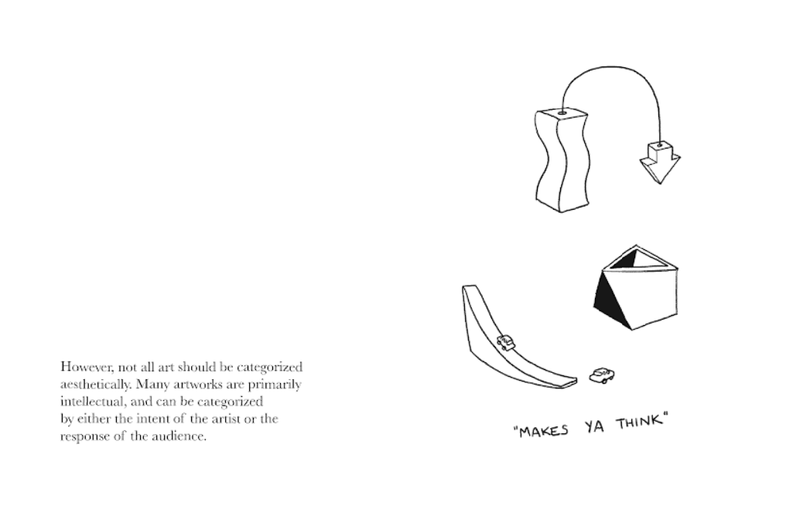 Throughout the book, Davis maintains that art invites and often requires audience participation. Why Art? opens as a textbook and then slides, languidly, into narrative. 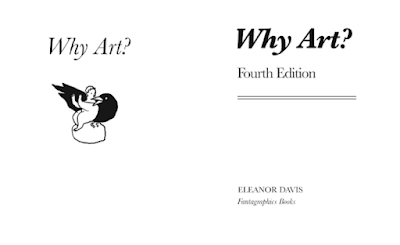 Unlike many of Davis previous books, like You and a Bike and a Road or How To Be Happy, Why Art? incorporates typed text alongside the handwritten, which underscores its initial textbook conceit. These two types of writing introduce a linguistic juxtaposition to the already-present image/text juxtaposition characteristic of graphic narrative. One appraises academically, whereas the other allies itself with the viewer and is more conversational in tone. Davis explores the idea of functional art through masks that make the wearer beautiful or ugly. As abstract concepts, beauty and ugliness (either in reference to individuals or artistic works) are totally subjective and often culturally constructed ideas. By implication, these masks are interchangeable and dependent on context. This context is defined largely as the preconceived views held by the artist, the wearer, and each of the mask’s viewers. Davis takes this point further with the introduction of literal mirror artworks, which distort or change the viewer’s reflection. This section closes by asserting the continued fascination with the ordinary hand mirror. What, we must consider, is distorted by the reduction of ourselves to two-dimensional images? At the end of this non-narrative section, Why Art? 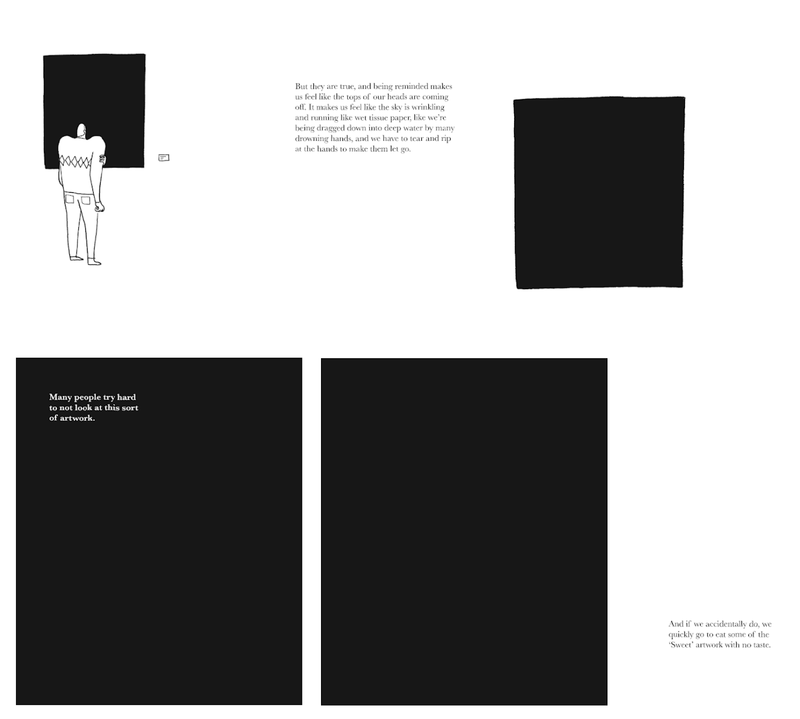 reflects on artworks that are “meant to remind the audience of things we’d rather forget, things so awful they shouldn’t be true” and which “Many people try hard not to look at.” Davis depicts this work as a square black canvas, its unspeakable awfulness a dark and solid void. Whether this is mortality, empty space, or some other cosmic terror, Davis forces us to stare, however briefly, into it. 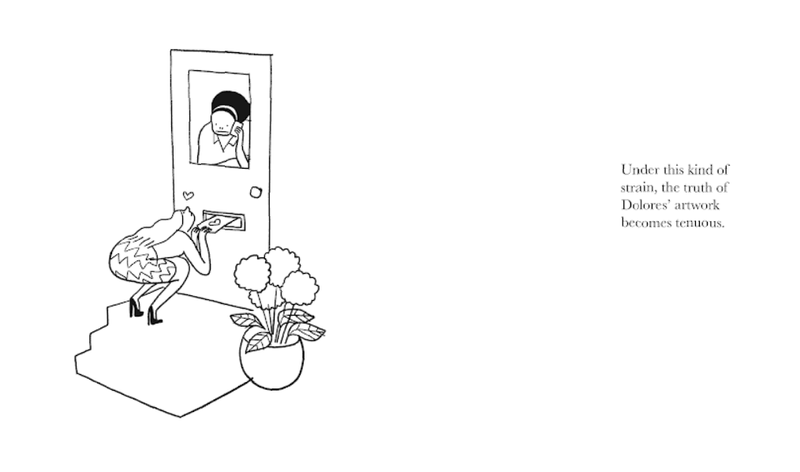 Visually, the book’s art remains consistent with Davis’ recognizable gestural style. Her figures are loose, kinetic, and slightly exaggerated. The images rely on strong and striking black and white contrasts, the people within them emotive and fluid. 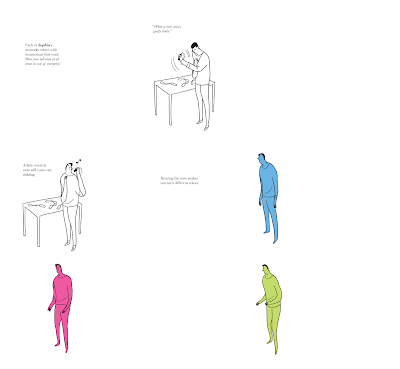 The first time Davis introduces actual color onto the pages, it’s synesthetic, part of an aural artwork that produces musical notes causing the viewer to themselves change color. There is something both direct and simultaneously elusive about Davis’ drawing style, at times almost minimal, a lodestar for the book’s tumultuous roil of ideas. Many pages coalesce around small, efflorescent details – the winding pattern on a dress, shadowbox tree-flowers, hands reaching, blooming against an inky darkness. 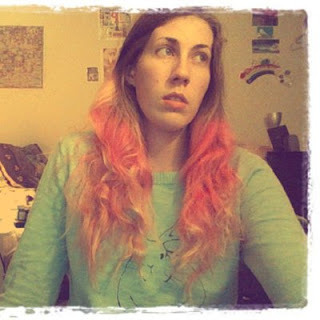 About a third in, Why Art? begins its narrative journey by introducing a group of different artists who are all participating in a gallery show together. These figures are performance artists, talisman-makers, painters, fabric artists – one even works in “concrete and fondant”. Davis follows a few of them individually, most memorably performance artist Dolores, who stands in a gallery and tells people, with conviction, that she loves them. This section calls to mind performance art like Marina Abramovic’s The Artist Is Present, a 2010 retrospective at MoMA where Abramovic sat for hours every day across from individual viewers, eliciting a slew of memorable reactions. Dolores’ performance practically parallels the book’s title, suggesting not “What is Art?” but rather “What is Love?” and for that matter, “What is authenticity?” Dolores’ viewers kiss her, propose marriage, follow her, and take her belongings. Thus, Dolores goes on a journey, faces trauma and hardship, recovers, and returns to the art world with a new piece that reflects her altered self. But while people appreciate her new work, they lament the discontinuation of her love performance, which she emphatically states she can no longer perform. This is, perhaps, the thesis of Davis’ enigmatic book, if you’re looking for a simple one. Maybe art exists to show us how to save ourselves from destruction. Perhaps it is how we make sense out of the world’s chaos and how we navigate what appears senseless. We are not, Davis seems to suggest, satisfied with Eden. We are compelled to invent, and re-invent, both the world and ourselves. This parable, in the latter part of Why Art? submits the apotheosis of the artist, who cannot help but make art in her own image. It blurs the lines between creator and consumer. When Dolores asks the miniatures how they can save themselves you can’t help but think, on the final two pages of yawning darkness, that they already have. Why Art? is beautiful, but not static. Like all great art, it invites interpretation and rewards careful consideration. 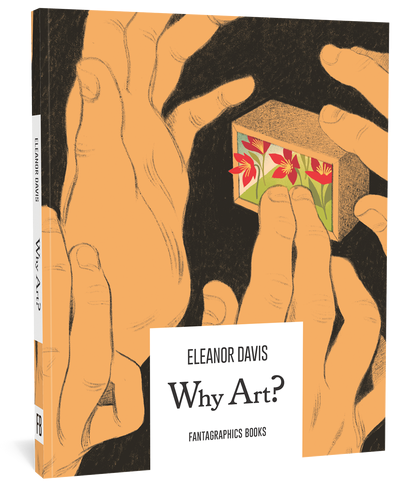 Davis continues to occupy a venerable place in contemporary comics with this challenging and provocative volume of work, which demands engagement from creators and viewers alike. The result is a unique experience defined as much by the reader as by Davis herself.